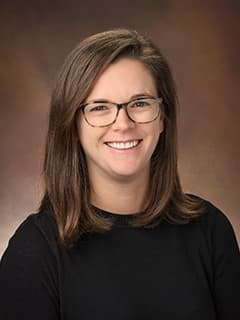 Kelly Brower, MD, is a pediatrician at Karabots Pediatric Care Center, West Philadelphia, a CHOP Care Network primary care practice. Almeida, GJ, Wert DM, Brower KS, Piva, SR. "Validity of Physical Activity Measures in Individuals After Total Knee Arthroplasty." Archives of Physical Medicine and Rehabilitation 96.3 (2015): 524-31. Brower KS, DelVecchio MT, Aronoff SC. "The Etiologies of Non-CF Bronchiectasis in Childhood: A Systematic Review of 989 Subjects." BMC Pediatrics 14.4 (2014). Garcia M, Brower K, Kim A, Jazayeri A, Erkoboni D, Engster S, O’Donnell R, Flynn E, Neubauer H, Keim J, Buboltz N, Costa D, Thompson ED. Lean Daily Management: Daily Inpatient Provider Driven Quality Improvement. Presented on July 30th 2016 at Pediatric Hospital Medicine Conference in Chicago Illinois.